Michigan development at full strength. This week we completed some basic remodeling of the main Digital Gamecraft™ headquarters. After three years splitting time with Los Angeles, California, we have again consolidated here in East Lansing. Before we piled too much equipment into this office, we took the initiative to clear it out, remove the nasty linoleum tile floor, repaint the walls bright white (from beige) to increase brightness, seal the floor to insulate the office from external odors, and install proper carpeting to muffle the ambient noise from multiple systems running in a limited space. With the addition of another bright lamp, this space is now very (i.e., even more) comfortable and conducive to productivity. Of course, over so many years, we collected lots of equipment that is not as necessary, or downright obsolete, and (I hate to admit) an abundance of cables running every which way, including some that were no longer connected to anything on one or even both ends. Now we are reloading the office with only the necessary, convenient, and/or inspirational items (and the best ones, in the case of duplication). At the moment, it is still a little spartan with just the fundamental development systems, but we will build it out for better efficiency as we perform our primary programming tasks over the next month or so. This primary development station currently handles Windows and Android development, as well as Linux, Unity (desktop), Unreal Engine, HTML 5, or almost any other platform for which we build products. It is positioned in the optimal location for seeing outdoors and minimizing reflections (to reduce eye strain). 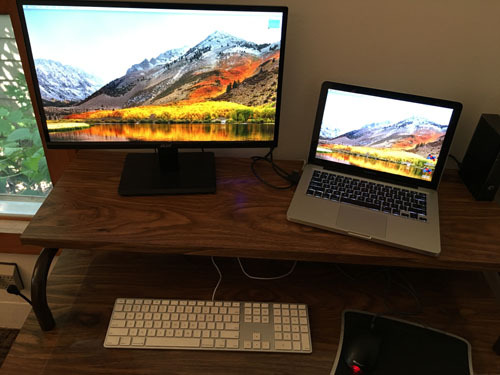 This secondary development station currently handles Mac and iOS development, as well as Unity (mobile), and other platforms when on the road. 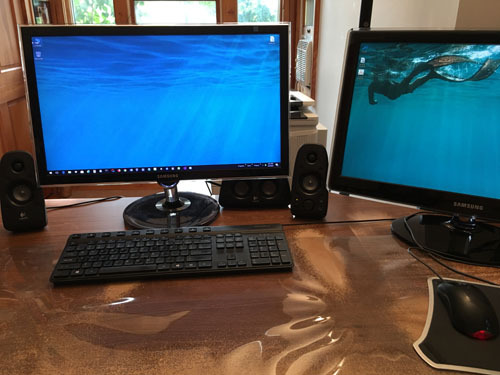 It, too, is positioned for reduced eyestrain, with minimal reflections and a direct view outdoors. This station facilitates development by giving an opportunity to relax and break away from direct problem solving, which often gives the unconscious mind some time to work the problem, or to simply blow off some steam. 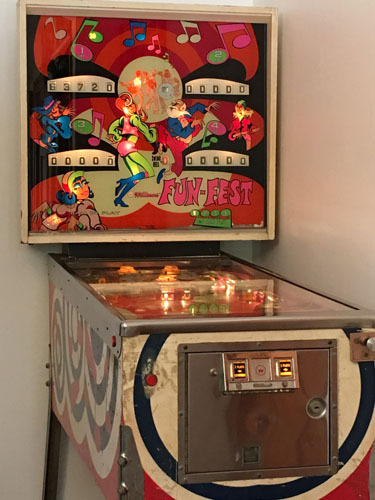 This pinball machine is a Williams Fun-Fest, an electromechanical (EM) model produced in 1973, which is fully playable, but slowly undergoing some restoration. It has been accompanied by an original arcade Galaga machine from 1981, but that cabinet currently needs a replacement CRT or board. This room also houses our primary server, which is headless, and a mobile device station consisting of two multiple device docks capable of charging 15 mobile devices (including Apple Watch) simultaneously, though we still need to charge the iPad Pro pen separately. Now that the remodeling, consolidation, and configuration of the office is (essentially) complete, we find that we have some extra time for external development projects. In these slow, summer months, we are booked to only about 25% of maximum capacity. If you have (or know anyone who has) need of a massively experienced game developer or team, please check out SophSoft, Incorporated at sophsoft.com. Of course, we have (literally) 32 more game projects prioritized for development under our Digital Gamecraft brand, plus a separate productivity product (to be announced), but I would love to discuss how we can help you make your vision into a published reality.